The news continued to get worse for Topps online sales with the print run of the set based off of the failed Fyre Festival concert. 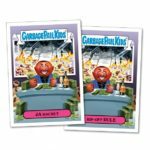 Last night Topps revealed the print run for Garbage Pail Kids Lord of the Flyes online set. As with sales of they daily online cards, this set offered for three days last week also set records for low sales. 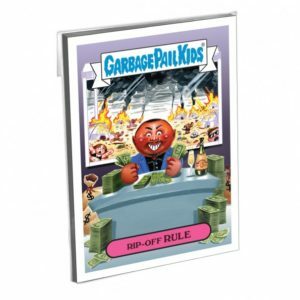 The GPK cards ended up the lowest sellers, with card #3a/b doing only 109 copies, a new low for GPK sales. The Wacky’s didn’t fare much better ending in the 120’s. With sales this low it will be interesting to see how Topps moves forward with online offers. Here is how the set ended up. GPK collectors have been anticipating what direction Topps will take with their online exclusives now that President Trump’s 100 days has passed. 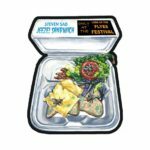 Today Topps launched Garbage Pail Kids Lord of the Flyes Festival set. This six card set consists of two pieces of new GPK artwork (Artist: #2 Camera, #3 Simko) available with a/b names, and two pieces of Wacky Packages artwork (Artists #1 Engstrom #4 Gross). The cards are based off of the failed Fyre Festival concert that was suppose to take place recently in the Bahamas. Each two card GPK set, or individual Wacky card can be purchased fro $9.99. The entire set can be purchased for $29.99. Because the set is being marketed under their other award/music sets there are not quantity purchases available. Shipping is free within the US via the SmartPost method, or $10 internationally. The cards are available for three days via topps.com. Topps will reveal the print run at the end of the sale. Here is the checklist along with pictures of the cards.